Kansas is the first new No. 1 since Gonzaga took over in Week 13 on Jan. 30. With only a few more games to play before most conference tournaments start, teams are running out of time to make their NCAA tournament case. Those statements already are being made, loud and clear, by the best teams in the country. The top 10 teams in the AP Top 25 poll suffered just three losses on the week (two belonging to Baylor), and only eight ranked teams fell. 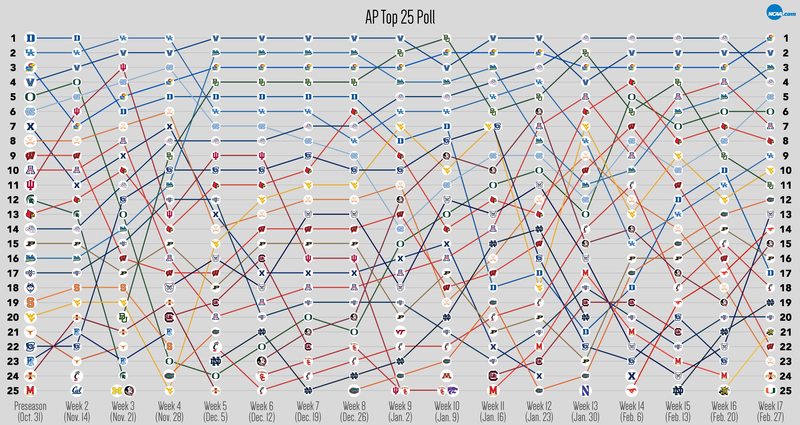 So for the second week in a row, the Top 25 stayed relatively calm. 31-17 -- ranked teams’ record last week, including a 13-7 mark for top 10 teams (off some from Week 16's 16-3). 9 -- conferences that are represented in this week's Top 25. The ACC has the most teams with seven, while the next closest has four. By weighting the conferences by team rankings (No. 1 is worth 25, No. 25 is worth 1), the ACC comes out in first place, followed by the Pac-12, the only conference with three teams sitting in the top 10. 8 -- spots, the biggest jump this week: by Butler (No. 21 to No. 13). On Jan. 4, Butler upset then-No. 1 Villanova 66-58 at home. Wednesday, the Bulldogs proved that was no fluke, going on the road to again take down Villanova, the No. 2 team in the nation, 74-66. Butler has now won four straight and is 6-2 against ranked teams, including 3-1 vs. the top 10. 6 -- spots, the biggest drop this week: by Wisconsin (No. 16 to No. 22). Wisconsin has lost four of its last five contests, all to unranked teams, and none closer than six points. Last week, the Badgers fell to Ohio State 83-73 and Michigan State 84-74. Both were tough conference matchups on the road. Still, Wisconsin is running out of time to right the ship before the postseason. 5 -- weeks, the longest upward streak: by Florida. The Gators' nine-game winning streak finally came to an end against No. 11 Kentucky, but Florida is still quite hot. The Gators dropped to No. 25 in Week 12 (Jan. 23), but have climbed all the way to No. 12 in this week's rankings. Florida finishes out the season at home against Arkansas and on the road vs. Vanderbilt. 4 -- weeks, the longest streak down: by Virginia. The Cavaliers rose all the way to No. 9 in Week 13 (Jan. 30), but are 2-5 (not counting Monday night's win against UNC) since. That stretch included four losses in a row and three upsets by unranked teams. 12 -- teams that have been ranked in the top 5 at some point. Duke (Preseason, Weeks 2, 4-8), Kentucky (Preseason, Weeks 2-4, 11, 12), Kansas (Preseason, Weeks 3-17), Villanova (Preseason-Week 17), Oregon (Preseason, Weeks 2, 14), UNC (Weeks 2-4, 17), Indiana (Week 3), Baylor (Weeks 5-10, 12, 13, 15), UCLA (Weeks 5-11, 16, 17), Gonzaga (Weeks 9-17), Arizona (Weeks 13, 15-16) and Louisville (Week 14). 6 -- teams that have been ranked No. 1 this year. Duke (Preseason-Week 2), Kentucky (Weeks 3-4), Villanova (Weeks 5-9, 11-12), Baylor (Week 10), Gonzaga (Weeks 13-16), Kansas (Week 17). 42 -- teams that have been ranked this season. 11 -- spots, the biggest single-week drop: by Duke. The Blue Devils fell from No. 7 to No. 18 between Week 10 (Jan. 9) and Week 11 (Jan. 16). During that span, Duke went 0-2, losing to No. 14 Louisville (78-69) and No. 9 Florida State (88-72). Oregon may have Duke beat in the anvil category. The Ducks plummeted 19 spots in two weeks, from No. 4 to No. 23 with a stop at No. 13 (Week 2, Nov. 14 – Week 4, Nov. 28). The Ducks were 3-2 during that stretch, falling to unranked Baylor (66-49) and unranked Georgetown (65-61).